Mario from Tribest Corporation at the Green Festival, Los Angeles, CA, October 2011: So, I’m here to explain the benefits of juicing. One of the benefits of juicing is that it…you are able to get in as many nutrients and digestive enzymes into your body as fast as possible because it…the…It allows the body to be free of the digestion process so it is able to get those nutrients a lot faster. 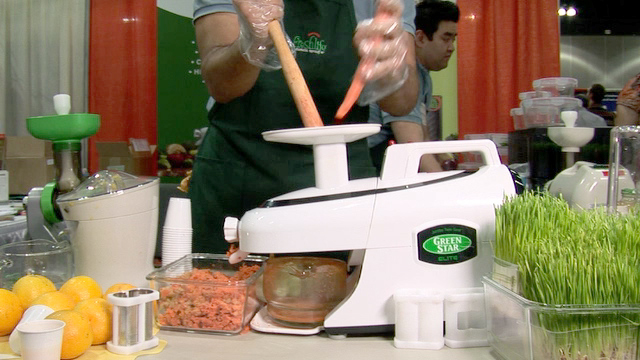 Our Green Star juicers operate at 110 rpm so it allows for the preservation of the nutrients and enzymes, greater preservation. 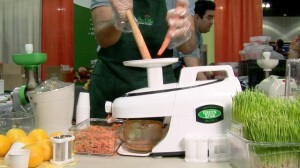 It also has bio-ceramic magnetic technology within the within the twin gears of the juicer. So, that’s another tool that allows us to preserve the nutrients and enzymes in the fruit and vegetable juices for as long as possible. If you’d like to order our Green Star juicers, or any of our other products, our personal blender, our food dehydrator, our sprouter, you can go ahead and visit us at our website which is Tribestlife.com. Pamm Larry, Green Festival, Los Angeles, CA, October 2011: Hi! My name is Pamm Larry, and I call myself initial instigator of the initiative to get genetically engineered foods on our ballot in California in the year of 2012. This movement started off with one person in March—that would’ve been me—and now we have over 100 leaders throughout the state that organizing their communities having tabling events, showing films and we’re now starting to gear up for getting…gathering signatures. Which is really exciting! So, people want to know what a GMO is. GMO stands for genetically modified organisms which are also called genetically engineered foods. This is not a hybrid, okay. It’s not a hybrid. It’s not grafting. It’s not anything that could happen in nature. What this is…is in a laboratory setting they take the DNA structure from one plant, animal, organism, or whatever and insert it into…They take it out. They extract it, and they unnaturally insert it into another plant, animal, bacteria, organism, or whatever. And, then they make seeds out of that and then they plant it. So, for instance, there’s this bacteria called Bacillus Thuringiensis, also called Bt. Okay. It can kill bugs. It’s a naturally occurring organism that’s in the soil. They take the genetic part out that kills the bugs. They extract it, and they insert it into the DNA structure of the corn so that when a bug eats the corn, the bug dies. The thing is though then they take that corn and they make our corn chips. They also do things like they feed it to the animals and the animals eat it. And the animals are having a lot of problems now. That have been studied. It’s been studied. There are a lot of allergy problems. There’ve been a lot of infertility problems, increased toxicity, gastrointestinal problems. It’s a mess. Unfortunately, there have been no long-term studies. That’s right. 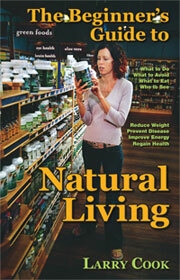 No long-term studies on humans, on the effects of genetically engineered foods. So, we the people of California, feel like it’s time to label them. So that we can know what we’re eating, be given the option of eating them or not, and then be able to track whether they’re causing problems in us, and our children. So, anyway thanks. Please join us. Come to www.labelgmos.org. Please help us gather signatures. We’re going to be getting started really soon. You’ll be trained. It’ll be fun. You go out with friends. It’s not scary. Join us and make us very powerful. Thank you very much. Larry Cook, Natural Health Author & Video Producer: And, if you want to avoid GMO food completely, you can eat organically grown food. That’s the easiest way right now to avoid GMO food. 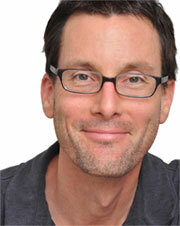 I also talk about GMO food on my website www.thenaturalguide.com, and why to avoid it. 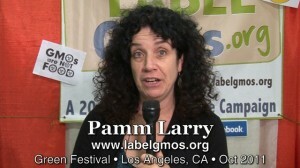 I give an in-depth explanation, and if you want to help out Pamm with what she’s doing, go to her website www.labelgmos.org. If you like this video, please let us know and hit the like button. If you want to see more videos like this please subscribe, and if you have any questions or comments, please leave those as well. I’m Larry Cook. Thank you for watching.